Plan to enroll in one of our medical programs such as Practical Nursing or Medical Assistant? Prepare for the entrance tests by attending our FREE Medical Prep Classes. Classes are held on Tuesdays & Thursdays from 9:00 a.m. to Noon. CALL 419-238-5411, Option 2 to sign up for the next session. Vantage is one of only EIGHT accredited locations in Ohio where you can earn your American Welding Society (AWS) certification? Call Vantage's Ohio Technical Center today to register at 419.238.5411, opt. 2. 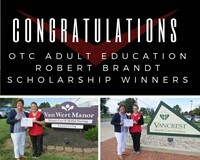 Kirsten Olwin and McKenzie Webb, Vantage OTC Adult Education Licensed Practical Nursing program students, were awarded the Robert Brandt Scholarship, presented by Lisa McClure of the Paulding County Foundation. Congratulations Kirsten and McKenzie! Read more about the Robert Brandt Scholarship and how you can enroll in our next OTC Adult Education programs here. The Ohio Technical Center at Vantage Career Center connects adult learners with full-time and part-time training programs to help them increase skills or prepare for a new career. Refresher courses and self-paced online courses are also provided by the OTC at Vantage. In addition, the OTC can provide information about Aspire and GED, assessment services, or customized training for local employers. "Vantage provides authentic, student-focused,career-technical training that prepares high school students and adults for employment and further education"